Home » Berita » Is there space for a progressive Islamic party? Is there space for a progressive Islamic party? KUALA LUMPUR: The idea of forming a new moderate Islamic political party has certainly caught the attention of many political observers who obviously vary in the idea of projecting it. While some observers predicted a better outcome for Malaysian politics as a whole, others described that the move would squander the opportunity for the Malays to regain their power. The idea to establish such a moderate political party came from those defeated PAS members in their recent party polls. The likes of Mohamad Sabu, Dr Mujahid Yusof Rawa and Dr Dzulkefly Ahmad and others who have all lost to the hardliners in the Islamic party depicted the need to form a party that is not just exclusive for the Muslims – but for all citizens. But what do ordinary Malaysian citizens think about the idea? Would it benefit the multiracial society in the country or would it just be another political party that merely replaces PAS? Berita Daily speaks to a number of ordinary people for their feedback. “Yes, I do support any intention of forming a moderate Islamic party. A new Islamic party is needed to replace both PAS and Umno. I do not support race-based or religion-based party but if a moderate Islamic party is being formed by the likes of Mat Sabu and Dr Mujahid, surely this so called new party will defend the fundamental rights of all Malaysians. “Umno from the very beginning is a racist party and sadly, PAS who once said that the party is for all, is now heading that way,” said Mandeep Singh, an active member of Kelab Bangsar Utama – a non governmental organisation. Asked on how he wanted the new progressive party to function, Mandeep who is also an electoral observer, explained that although the party would be headed by Islamists, the party should move away from race and religion based politics. The 29-year-old Selangorian added that the committee members of the party should start engaging with civil society organisations such as Sisters In Islam (SIS) and Bersih – an effort that was never done by PAS. “They should sit and discuss with civil rights groups so that they could listen to everyone's opinion. The new party should not only speak about one race or religion, but must represent Malaysians,” Mandeep said. For Muhammad Anas Danial Ismail, a new progressive party is needed as the discourse of Islamism in the country has been too polarised by Umno and PAS. He described that at the moment there is no other alternative for the discourse of Islamism, saying that the conservatives in PAS were no different from those in other right-wing groups such as Ikatan Muslimin Malaysia (Isma). “As a Malay Muslim, I would say that it is needed because the discourse of Islamism has been dominated by Umno and PAS and there is no other alternative. 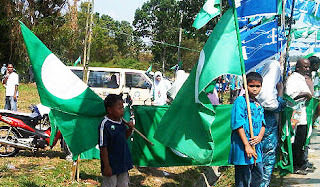 The conservatives in PAS is similar to those in Isma or in Umno. An alternative voice is needed,” he said when contacted. Adding further, he explained that the new party must learn how to interact with society in general while saying that it must represent a more inclusive view of Islamism. “Those in the new party must not act in a 'holier than thou' approach and they must be relevant to the society. They must know how to interact with the society and must be more inclusive in their views,” he said. Agreeing with Anas, Muhammad Nazreen Jaafar said it was timely for the country to adopt such an approach, stating that the trend of Islamic conservatism where religion has become a thought control and has become a tool to secure power of interest. Citing the example of Indonesia, Nazreen who is a former aide to PKR president Dr Wan Azizah Wan Ismail, said that perhaps with the creation of a new progressive Islamic political party, Malaysians could learn from the emergence of various Islamic parties in Indonesia that had led to form a political maturity in the public sphere. “The advent of Islamic parties in Malaysia would lead into vibrant discussion on the position of Islam in our country. Moreover, we can learn from Indonesia during 90s where the emergence of Islamic parties such as PPP, PKS, PKB and others were able to bring political maturity into our political landscape,” he stated. Meanwhile, according to Zoe Randhawa, any new party must work towards a secular democracy in order to unite the nation. While not suggesting the new party to abandon its Islamic rhetoric, the former student at London School of Economics said that the party must also respect the diversity and various beliefs in the society. “The only way forward is to work towards a secular democracy and that is the only way to unite a multiracial, multi-ethnic society like Malaysia. “I am not suggesting that they get rid of their Islamic rhetoric but they have to respect that Malaysia is a secular state with multi-ethnicity. The agree to disagree policy being practised by the opposition is making them hard to unite as a front. “For me, the idea of coalition in politics, should be removed,” Zoe said. However, for University of Malaya Student Council vice president 2, Kalaivaanan Murty, the idea of progressivism must lead to the idea of significant paradigm shift while rejecting the idea of giving an old book a new cover. “If the question points out to the idea of replacing an old political party with the new one then I would contend that it shouldn't. Why do you want to give an old book a new cover. Progressivism if one really connotes to idea of it, leads to the idea of significant paradigm shift. One must be able to perceive matters through the eyes of fair comments and principles. “If one perceives to be preaching for progressive Islamic views then that particular person should in my humble opinion let go of the religious title and adopt a more Malaysian title. “Progressive Islamism must be rooted back to the people. It must be of the nature that people from different religion look up to it as the true reflection of the religion and I believe that it should stem within a multi-religious political party,” he opined. Kalai's opinion was mirrored by his UM compatriot, Khairol Najib Hashim who said that while it is needed for a new progressive party to be initiated, the party must place the people's agenda as the party's main priority. Khairol, who is the chairperson of Kesatuan Mahasiswa Malaysia, added that the progressives in PAS dubbed as the G18 should charge into action immediately to create a new political platform for Malaysians. “People's agenda must be their first priority and then only the party's agenda. It can't neglect the promise that the opposition have given to the people. “In my view, they must act fast and it must be now. Two years away from the next general election and it is not long before it comes. They have to get the platform ready for Malaysians. It is evident in the last GE that Malaysians are hungry for a change,” he said.